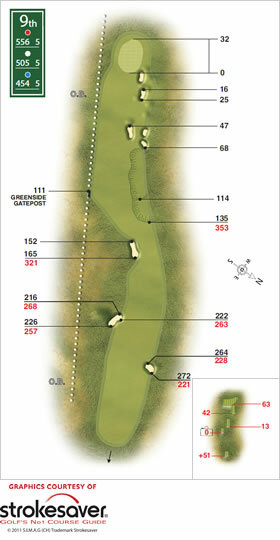 Short by modern par five standards, but the hole plays straight into the prevailing wind. The tee shot landing area is squeezed between a deep bunker to the left and thick rough on the right, leading many players to lay up. Even off a really solid drive it is very difficult to chase a long running shot past the bunkers on the right to a green set uncomfortably close to the out of bounds wall that runs all the way down the left side.